The mission of the Kiran C. Patel College of Osteopathic Medicine is to provide learner-centered education, both nationally and internationally, for osteopathic medical students, post-graduate trainees, physicians, and other professionals. 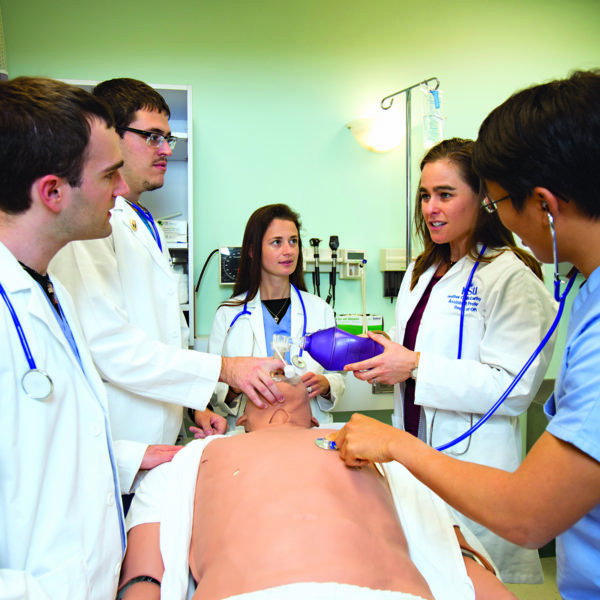 Through its interprofessional programs, the college prepares competent and compassionate lifelong learners; supports research, scholarly activity, and community service; and advocates for the health and welfare of diverse populations, including the medically underserved. The Health Professions Division, with a student body of nearly 8,000, is home to Nova Southeastern University Dr. Kiran C. Patel College of Osteopathic Medicine—the first osteopathic college established in the southeastern United States. As a student in the Health Professions Division of Nova Southeastern University, you can anticipate a remarkable experience. You will train, study, interact, and share facilities, faculty, and resources with other health professions students. Nova Southeastern University Dr. Kiran C. Patel College of Osteopathic Medicine has been granted accreditation by the Commission on Osteopathic College Accreditation of the American Osteopathic Association. Dr. Kiran C. Patel College of Osteopathic Medicine is located on the beautiful campuses in Fort Lauderdale and Tampa Bay/ Clearwater, Florida. With a dedicated and professional faculty, establish affiliations with many hospitals, clinics, and health care systems in the two areas; the mission to educate professional capable of providing highest-quality health care service is an achievable goal. 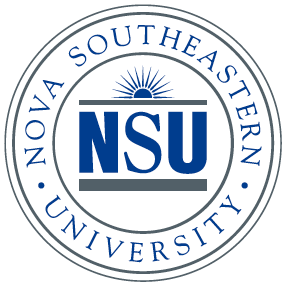 The college is a member of the Nova Southeastern University family which has nearly 22,000 students. It is the second largest, private, nonprofit university in the Southeast and one of only 37 universities (out of more than 4,000) that have earned designations for both High Research Activity and Community Engagement from the Carnegie Foundation for the Advancement of Teaching. The university comprises undergraduate, graduate, and professional schools of osteopathic medicine, pharmacy, optometry, health care sciences, nursing, medical sciences, allopathic medicine,dental medicine, law, marine biology and oceanography, business and entrepreneurship, aviation, education, engineering and computing, conflict resolution, arts humanities, social sciences, natural sciences, family therapy, psychology and counseling, and early childhood and autism studies. Off-campus housing services provide incoming and current students with rental information concerning all types of local housing. Other resources include a roommate-finder service, moving tips, answers to frequently asked questions, and location area resource links to help make your move easier. The Health Professions Division is unique in that it has been developed as an interdisciplinary educational center from its inception. The division was founded on the concept that the interdisciplinary approach to education is beneficial to students of all professions and that by preparing students to work effectively with health care providers from different fields, barriers are broken and patient care is enhanced. Over the past 35 years, NSU’s Health Professions Division has developed into a multidisciplinary academic health center of international stature. 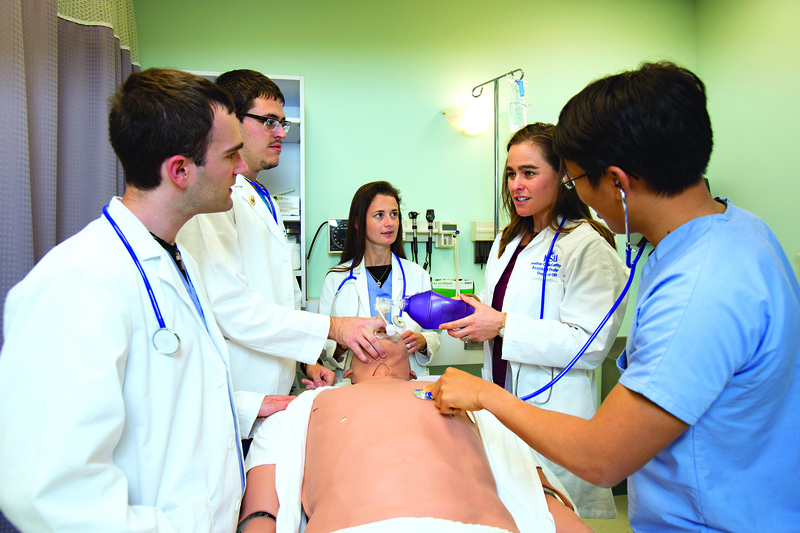 The colleges within the HPD, which include osteopathic medicine, pharmacy, dental medicine, optometry, health care sciences, nursing, allopathic medicine, and medical sciences, have redoubled their commitment to academic excellence, innovation, and community service while expanding its mission in research and scholarship. Together as a team, the distinguished faculty prepares students for an exciting career on tomorrow’s dynamic health care team. The Doctor of Osteopathic Medicine (DO) is a professional degree that requires four years of professional study. Our innovative curriculum is designed to fulfill our mission to produce exemplary osteopathic physicians known for competent and compassionate care. 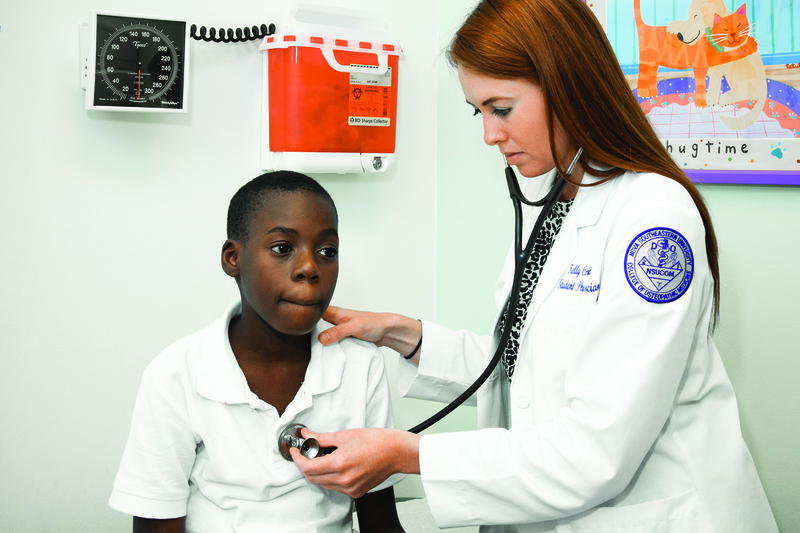 Bachelor of Arts /Doctor of Osteopathic Medicine/DO – Students in the 3+4 program will receive a bachelor’s degree after successfully completing their first year in Nova Southeastern University College of Osteopathic Medicine and will receive their DO degree after successfully completing four years of education in the program. After successfully completing a bachelor’s degree and the requirements for the 4+4 program, students enter the College of Osteopathic Medicine. Those students will receive their DO degree after successfully completing four years of study in the program. Bachelor of Arts /Doctor of Osteopathic Medicine/DO – Students in the 3+4 program will receive a bachelor’s degree after successfully completing their first year in KPCOM and will receive their DO degree after successfully completing four years of education in the program. After successfully completing a bachelor’s degree and the requirements for the 4+4 program, students enter the college of osteopathic medicine. Those students will receive their DO degree after successfully completing four years of study in the program. Doctor of Osteopathic Medicine/Master of Business Administration – The Master of Business Administration program runs in conjunction with the H. Wayne Huizenza School of Business and Entrepreneurship. Doctor of Osteopathic Medicine/Master of Public Health – The Master of Public Health program is designed to prepare students to define, critically assess, and resolve public health problems. The program emphasizes acquisition of knowledge and skills for promoting health, preventing disease, and conducting research. Doctor of Osteopathic Medicine/Master of Science in Nutrition – Based upon the 2010 Patient Protection and Health Care Affordability Act Congress has put an increased demand on the health care delivery system for preventive services, which includes nutrition in almost all areas in primary care. NSU’s new Master of Science in Nutrition provides an excellent inter-professional graduate degree for student leaders who want to integrate nutrition into the field of osteopathic medicine. Doctor of Osteopathic Medicine/Master of Science in Biomedical Informatics – The Master of Science in Biomedical Informatics trains future leaders in the development, dissemination, and evaluation of information technology as it relates to the health care environment, which includes hospitals, health care delivery systems, health information technology system vendors, eHealth companies, insurers, pharmaceutical companies, and academic institutions. Doctor of Osteopathic Medicine/Master of Science in Disaster and Emergency Management – The Master of Science in Disaster and Emergency Management trains future leaders in the field of emergency operations. This program is designed to provide students with the theoretical knowledge and applied skills needed to work in this rapidly growing field. Doctor of Osteopathic Medicine/Master of Science in Medical Education – This program is designed to help faculty and preceptors enhance their professional education and teaching skills as well as to expand their ability to facilitate the learning process of students and residents in a variety of clinical teaching environments. With this knowledge, clinical educators will learn the skills to lead in dynamic and changing health care systems. Doctor of Osteopathic Medicine/Doctor of Dental Medicine – This program was designed to address the access to care issue and meet the needs of underserved populations. Nova Southeastern University’s College of Dental Medicine and Dr. Kiran C. Patel College of Osteopathic Medicine have structured a curriculum that provides students with an opportunity to receive a DMD (Doctor of Dental Medicine) and a DO (Doctor of Osteopathic Medicine) degree. This DO/DMD Dual- Degree Program is symbiotic with the missions of both schools. Graduates of this program will be prepared to use a holistic approach to health care that will address preventive medicine and general dentistry, as well as access to care issues, and meet the needs of the rural and underserved populations. Doctor of Osteopathic Medicine/Juris Doctoral – This program allows students to earn a Juris Doctorate degree, offered in conjunction with Shepard Broad College of Law, in a complementary discipline and in a compressed time frame. 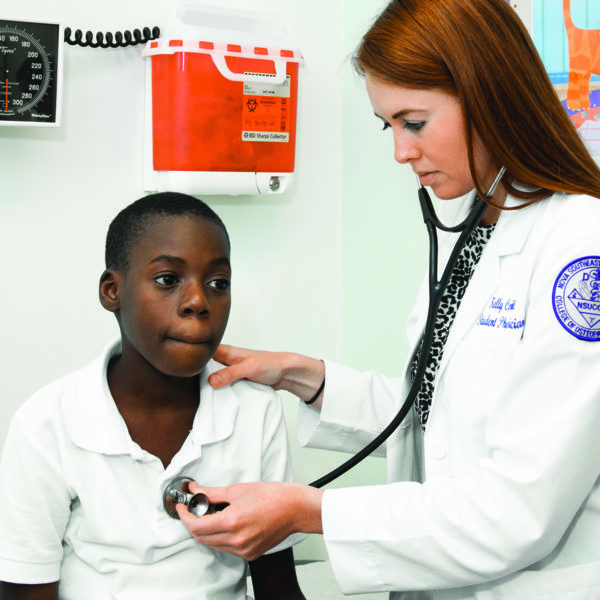 The Master of Biomedical Sciences (MBS) is a program for students to demonstrate that they can be successful in the Nova Southeastern University’s osteopathic medical program. Students are trained in human biology and medicine to improve their academic credentials in order to be considered for admission to our professional schools. Those enrolled in this program take basic science courses, along with osteopathic medicine students. Courses offered include gross anatomy, histology, neuroanatomy, biochemistry, microbiology, physiology, pathology, and pharmacology. Students who have successfully completed one year in this program will be considered for admission into KPCOM, pending a completed application process. Students who have successfully finished two years of this program will receive the master’s degree and then will be considered for admission to the college of osteopathic medicine after completing the application process to the professional program. A notable aspect of our clinical training program is a three-month clinical rotation at a rural or urban underserved area. Students will have the opportunity to learn about health care needs of various cultural and ethnic groups whose lifestyles and attitudes toward health care differ from those the student will see in more traditional sites. It is an enriching educational experience, in which students may select an international site for one of the three months. Upon NSU’s receipt of the AACOMAS application, NSU-KPCOM will forward an online secondary application to the student. The applicant must submit a completed secondary application and a non-refundable application fee of $50 no later than March 1, in order to be considered for admission. Upon receipt of both AACOMAS and secondary applications, each application is reviewed for possible interview. Those selected will receive an invitation. After the interview, the Committee on Admissions reviews each file and makes their recommendation to the dean. NSU-KPCOM works on a rolling admissions basis. Therefore, it is in the applicant’s best interest to apply early. For best consideration, applicants should submit their AACOMAS application at least four weeks prior to this school’s latest filing date. The Committee on Admissions recommends applicants to the dean based on demonstrated academic excellence, leadership, compassion, and commitment to the osteopathic medical profession. Oldest MCAT considered: Must be no older than three years prior to the date the AACOMAS application is submitted. Nova Southeastern University Dr. Kiran C. Patel College of Osteopathic Medicine requires the completion of a secondary application. Upon receipt of the AACOMAS application, NSU-KPCOM will forward an online NSU application to the applicant. The applicant should submit the NSU application along with a nonrefundable application fee of $50. Waivers are available to applicants who receive AACOMAS fee waivers and are selected for an interview. Fees that are paid at the time of submission of supplemental application and are refunded once the AACOMAS waiver is verified and KPCOM interview has taken place.